To New Super Mario Bros. U είναι ένα ακόμα παιχνίδι του Wii U που μεταφέρεται στο Switch. H Nintendo ανακοίνωσε το New Super Mario Bros. U Deluxe, το οποίο διαθέτει επιπλέον playable χαρακτήρες τους Nabbit και Toadette και περιλαμβάνει επίσης το New Super Luigi U. Το New Super Mario Bros. U Deluxe βγαίνει 11 Ιανουαρίου 2019 για το Switch. Δείτε επίσημα χαρακτηριστικά και trailer και πείτε μας αν σας ενδιαφέρει! • A variety of playable characters are available, some with unique attributes that affect gameplay and platforming physics. • Younger and less-experienced players will love playing as Toadette, who is brand new to both games, and Nabbit, who was formerly only playable in New Super Luigi U. Both characters offer extra assistance during play. • Multiplayer sessions are even more fun, frantic, and exciting thanks to entertaining character interactions. Need a boost? Try jumping off a teammate’s head or getting a teammate to throw you! • Features a wealth of help features, like a Hints gallery, reference videos**, and a Super Guide in New Super Mario Bros. U that can complete levels for you if they’re giving you trouble. • Three additional modes—Boost Rush, Challenges, and Coin Battle—mix up gameplay and add replayability, while also upping the difficulty for players who want to try something harder. Players can use their Mii characters in these modes! • Share the adventure with a friend! 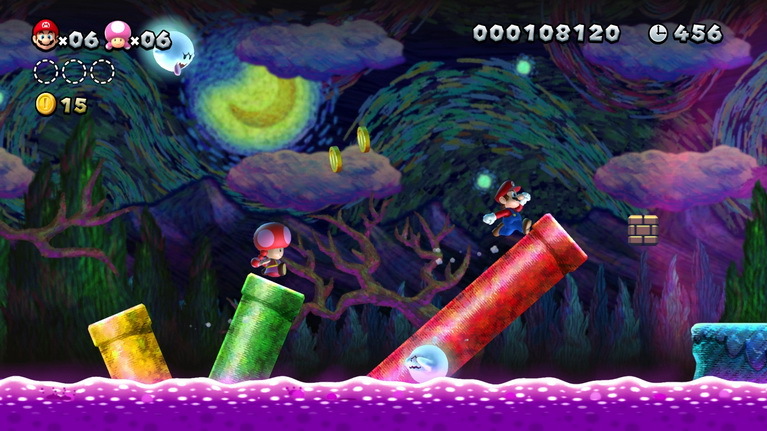 During two-player co-op gameplay, each player can use a single Joy-Con controller, so no additional accessories are required. And to add two more players to the mix, all you need is one extra set of Joy-Con controllers (sold separately).